Jen Chaney, I demand more of these! Clueless has always been one of my favorite movies. I remember vividly seeing it for the first time at a slumber party when I was 10 or 11 — knowing for certain that my mother would NOT want me watching it, but loving it anyway (although about half of the jokes/references went over my head for years — I didn’t figure out that Christian was gay until I was in high school). I even read the books, and loved the TV series that starred Rachel Blanchard. And I also love oral histories of TV shows and films — Vanity Fair runs them every once in a while, and I always devour them. So basically, this book could not have been more perfect for me. 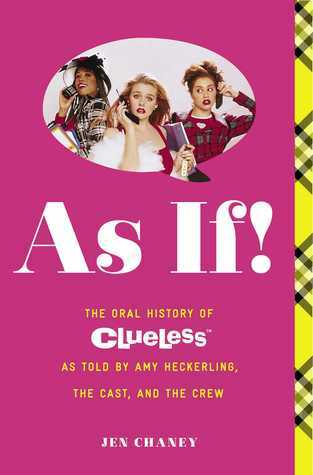 For As If!, Jen Chaney sits down with just about everyone involved in Clueless — from the awesome Amy Heckerling, to the cast, the producers, casting agents, musicians on the soundtrack (she interviews Coolio!) and many, many others. Did you know people still come up to Breckin Meyer and quote the tardy speech? That’s SO on my bucket list. Chaney also compiles newspaper articles, reviews and other interviews with the cast and crew. It reads beautifully — just like sitting down and listening to the participants yourself. She starts with its initial conception, and runs through everything — ending with the impact of such a ground-breaking movie. There’s also a lovely tribute to Brittany Murphy. I wouldn’t bother to read it if you haven’t seen the film, but if you haven’t seen the film, then I highly recommend watching it this instant — and then reading this awesome book. Share the post "Jen Chaney, I demand more of these!"